IN the continuing series of getting to know our Under-23s, we profile Deshane Dalling, who joined the R's from Huddersfield Town last season. 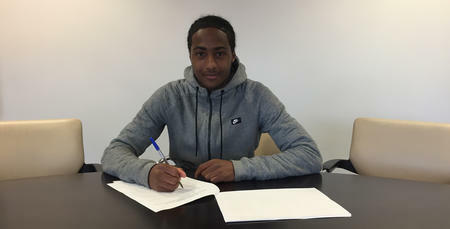 Deshane Dalling joined QPR mid-way through the 2017/18 season after a short spell at Huddersfield Town. A left-winger that plays with both feet, Dalling played non-league football with Bostik Isthmian Football League side Staines Town FC until he was 18. 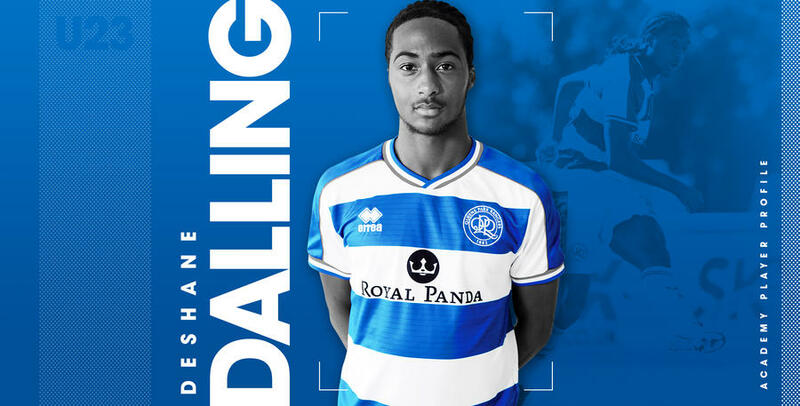 Dalling signed a one-year deal at QPR in May 2018 that keeps him at the club until the end of the 2018/19 season. Deshane Dalling walks into his first full interview as a Queens Park Rangers player with a brace around his left knee, but a smile on his face. A couple of minutes later, when he’s asked to sum himself up, he says “quite bubbly”. That comes across all too clearly, particularly for a player who is halfway through recovering from an MCL injury. He’s a positive young player, both on and off the pitch. On it, he’s a penetrative left-winger who uses both feet. Off it, he’s grounded. It’s no surprise when you learn that he didn’t sign for a professional club until the age of 18. Dalling began to flourish when he started a sport science course at Kingston College. “I was just trying to do something in the football industry. I signed for Staines Town and I blossomed from there, doing well in the first team, playing games. I met an agent and from there…” He doesn’t complete the sentence, and later he admits it’s all been a bit of a blur. In the last two years, Dalling has gone from a student at college playing occasional games for a semi-pro side to signing for Premier League Huddersfield Town to returning to London and QPR. That’s why he went to Kingston College. His family, though, kept pushing him, making sure his talent didn’t go to waste. “No one in my family quit on me,” Dalling explains. “Even if I was playing Sunday league, they wouldn’t give up on me. They’d be at my games, pushing me in the right direction. Dalling has overcome challenges aplenty. The MCL injury is tough, but it was less than five years ago that another injury stopped him signing for Fulham. He’d had interest from a number of clubs after attending a Soccer Showcase. “We played matches in front of scouts. There was a few there. Fulham, Millwall, Coventry, Hull – they were all interested in me. I had the chance to go to Coventry, but I couldn’t because of the transport. It was too far from where I lived. That’s when the support of his family was more important than ever. “It means everything. They could see I was down after going from club to club with nothing working out. I finally got my chance at Fulham, about to play a game and I got injured. “I mean…” he tails off. It worked out eventually, of course, but the journey wasn’t easy. He played for Staines while he studied at Kingston College. At the start, it was mainly in the youth teams where, Dalling admits, they “won everything.” A youth league and a Middlesex FA Youth Cup. After a good pre-season with the first team, he got his chance. “I played about 10 games for the first team. My first was a Cup game. They [Staines] were just testing me out a bit. At the end of November of that season, Dalling went on trial at Huddersfield for a week. He played a game against Grimsby. Huddersfield took Dalling on trial again and this time put him in training with the under-23s. He was only 18. A game against Hull, which included a couple of the Tigers’ first team players, made up the minds of the Huddersfield coaches. It could have been different for Dalling. He could have signed for another club nearer to home, rather than Huddersfield. And that club was, in fact, QPR. “Before I went to Huddersfield, I came here for two days and I was offered a contract. It was a predicament. Obviously [at this stage], I have no idea, no clue. I’m new to this. I don’t know what’s what. From Isthmian league Staines Town to Premier League Huddersfield Town. A jump of six divisions. “It was a big difference. Even just getting as fit as them, I was thinking ‘how do they do this every day?’ I really didn’t know. Most players who come through at top-level clubs in the modern era have been at an academy since they were six or seven. Deshane is different, of course. He spent the first decade of his football life playing casually, or at least not professionally. “The step up is so enormous. The food, the staff, the coaching, the fitness, the pitches, the speed, the physicality. It all changes. And even the way you watch a football game. “If I watch players like Neymar and Mbappé, I try to imitate some things that they do. I look at Neymar’s starting position and his end position and how he moves from here, to here. Or how he gets into the right position at the right time, the timing of it, not just watching the ball but watching around him. “You try to bring that into your own game but my style is a bit unorthodox,” Dalling acknowledges. He takes the majority of touches with his left foot, makes most of his passes with his left foot. And he plays on the left. But he’s right-footed. So, and he says this with a little laugh, when he cuts in from the left flank onto his right foot, the defenders keep pushing him towards goal, thinking he’s left-footed. And then he unleashes a shot with his stronger foot: his right. “I play games with them,” he jokes. He wants to be in the first team. Dalling is 20, now. He’s only been in professional football for two years. In August, he was on the bench for QPR in an EFL Cup game against Blackpool. How was that? “I don’t know,” he says. And then says the same again. Three times. “I just don’t know how to explain the feeling.” A broad smile is emerging. Recovering from his injury, earning a new contract, playing in the first team. They’re all aims for Dalling, of different timescales. In Deshane’s own words, he’s bubbly. At the same time, he’s hungry for success. Maybe, when his first team chance finally comes, he’ll do what he did for Staines and Huddersfield, and score within a couple of minutes. That, would be quite something. Every day, my family were calling me, asking how it was going.